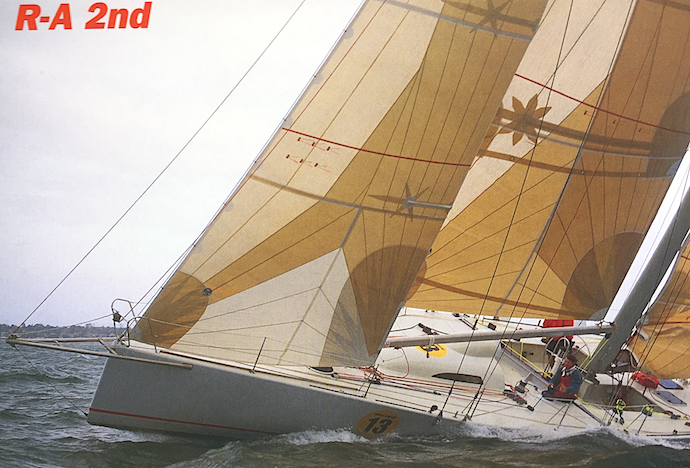 The Melbourne Osaka YAMAHA OSAKA CUP Double-Handed Yacht Race, held every 4 years, took place for the third time in 1995, the inaugural race having been held in 1987 followed by a successfully held race in 1991. The race is a short-handed race crewed by two, which reduces the difficulty of recruiting a full crew. It requires a great amount of skills and teamwork between the two. While many conventional international ocean yacht races require participants to make a latitudinal crossing of the globe, this race employs a unique course in that competitors cross the globe longitudinally from the Southern Hemisphere to the Northern Hemisphere. In addition, the race is exceptional in that a separate division is set up for the light, fast racing group and the heavier cruising group. The Cruising Division was created to give an opportunity for sailors who enjoy cruising in the South Pacific to take part in the race. Cruisers are not designed for racing, so they are robustly built and therefore heavy. Their inclusion gave some originality to the race. The race is also different from other large scale races, such as the Americas Cup and the Round-the -World Race, which require huge outlay of money. Cyclones may still occur in Australia’s eastern waters in March while typhoons occur north of the equator near the South Sea Islands in May. Accordingly, it is preferable for all competing yachts to have passed the equator by then. 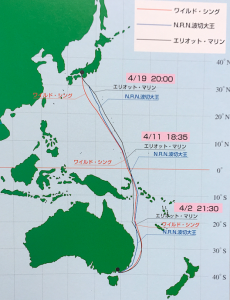 Therefore, the starting time from Melbourne was fixed for late March, so that the first boat would arrive in Osaka after April 20th and most of the others from the end of April through early May. This race is a “scratch race” without handicaps, making it easier for the general public to understand the race results, as the order of arrival is the placing. However, in this type of race, large yachts have an unfair advantage over small yachts, so the Racing Division and the Cruising Division were divided into 3 classes each, separating them by 2 meter intervals to reduce the unfairness caused by the size of yachts. The overall length of the yachts is between 1o and 16 meters as larger yachts are difficult to handle double-handed and smaller yachts cannot hold sufficient provisions for this distance. Severe restrictions were not imposed on the hull and rigging of the yacht, allowing modification for short-handed sailing. 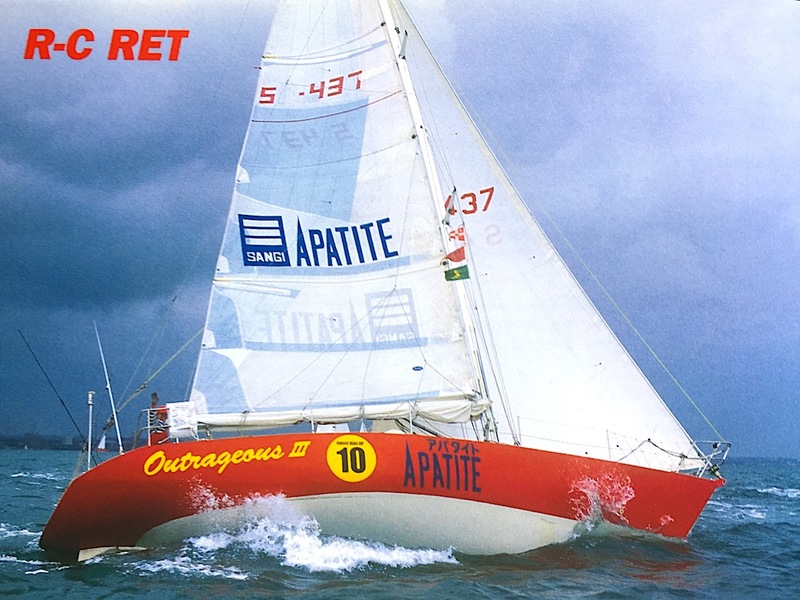 However, as the race is a long-distance ocean race, the ORC Special Regulations’ Category 0, with the strictest safety regulations, was applied as a condition of participation in the race. Furthermore, the yacht should have more than 200 n.m. and the crew more than 500 n.m. nonstop sailing experience prior to the race. Also, the race organisers provided all competitors with an ARGOS PTT (Platform Terminal Transmitter) to trace their positions at all times and to inform organisations concerned of their positions. In addition, each competitor had to carry a Satellite EPIRB, by which the yacht can be identified in case of emergency. The race started from the Port of Melbourne which has a close relationship with Osaka being a sister port. Because of the rip at the mouth of Port Phillip Bay the fleet is forced to go out within a limited period during the day when the current is right. Therefore, the race was divided into two legs; the First Leg from Port Melbourne to Rye and the Second Leg from Portsea, the mouth of the Bay, to Osaka. The fleet stayed overnight after the First Leg and started the Second Leg when the current was favorable. As the distances of these two legs differ greatly, the elapsed time of the First Leg was not included in the final race result. Accordingly, the Prize Awarding Ceremony for the First Leg was held after the Leg and that for the Second Leg was held in Osaka. 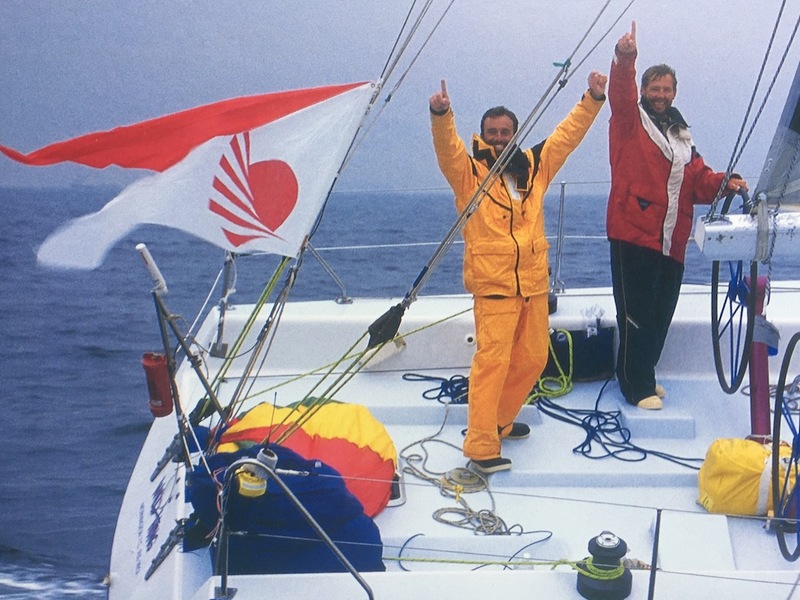 Competitors had to complete the full course from the Port of Melbourne to the Port of Osaka except in case of unavoidable circumstances, however the elapsed time for each may differ greatly, depending on the size and the performance of the yacht or the course chosen. As it would be inconvenient to the operational side of the race if the race dragged on, a time limit was fixed for each class: for the Racing Division, three weeks after the first finish. The official finishers within this time limit were provided with a delivery-cruise subsidy. To avoid disqualification in Osaka due to infringement of rules after 5,500 n.m., up to 10% time penalties were imposed except in the case of a serious infringement which would result in disqualification. During the race the position and movement of the fleet was followed by radio schedules. However, radio scheds might not cover all communications due to jamming or for other reasons. Accordingly, all competing yachts were once again equipped with the ARGOS PTT (Platform Terminal Transmitter) and the Satellite EPIRB to identify their positions, especially in case of emergency. The ARGOS System was originally developed for the automatic observation of weather conditions and ocean currents. The function of identifying the position of the transmitter has been diverted for use in research on migratory birds among other things. The signals from PTTs are received by a satellite circling the globe and stored until the satellite meets the land station, into which the information from PTTs is fed. The information is then processed at the land station into the latitude and longitude of where the transmitter was positioned. The positions acquired by the ARGOS System can be obtained in 1-5 hours depending on the movement of the satellite or the time required for the data processing. An ARGOS System suitable for yachts was redeveloped based on this function, with an additional function incorporated in which a different type of signal is transmitted by pulling a pin on the PTT when the yacht is is difficulties. This new ARGOS System is now used in other types of races in addition to doule-handed yacht races. EPIRB stands for Emergency Position Indicating Radio Beacon, whose emergency signals were conventionally received by aircraft or land stations and then reported to the nearest search and rescue organisation. However some emergency signals can not be received depending on the position of the transmitter. Therefore, in the last race a recently developed Satellite EPIRB System (in which the satellite receives emergency signals and automatically calculates them to identify the position of the transmitter, then reports to the nearest search and rescue organisation) was provided by the organisers upon special permission from the Ministry of Telecommunications. All participating yachts in this race had to carry a Satelite EPIRB. (As this System no longer violates Japan’s Wireless i eiegrapny Act). The system still requires international standardization as the numbering, procedure for registration and the price of the unit differs from country to country. In comparison with the inaugural and the second races, at the start the number of applications sent in was very low, which caused a little anxiety for all concerned. It seems that the slow start of applications resulted from the global economic situation and from the fact that the Pan-Pacific Yacht Race was held the previous year. By the deadline on October 31st, 1994, the entries had increased to 52, out of which 4 did not send in a formal application. By the time of the start, 18 had withdrawn and 2 had been forced to give up due to safety problems, which put the final number of starts at 28 (including the 2 late starters). 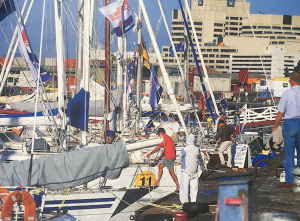 After arriving in Melbourne, each competing yacht had it’s equipment inspected at the Sandringham Yacht Club in accordance with the safety rules. When passed, the yacht was delivered to Victoria Dock in the port of Melbourne for the installation f rt PIT and for the loading of provisions safety inspection, inspectors from Australia and those dispatched from Japan discussed applicable inspection criteria and then faithfully and strictly carried out inspections. As a result, 2 yachts failed and withdrew. The differences from one country to another in judging specification details and inspection limits for equipment, in the content of medical supplies and in dealing with drugs was problematic when carrying out inspections. It took time to complete the safety inspection of all competing yachts as some yachts had not shown up by the deadline and others were under repair because of damage suffered during the delivery cruise. Consequently, a raised level of consciousness among competitors and reduced differences in criteria from country to country remain tasks to tackle in the future. Class C – First place; “Daiichi-Hanamaru”. The Second Leg started at 3:00 pm on March 26th when the gun fired from “Akogare” as on the previous day set the fleet underway for Osaka, accompanied by clear skies and a south wind of 5-6m/s which assisted them through the heads one by one. Bass Strait between the southeast corner of Australia and Tasmania is notorious for its rough conditions. 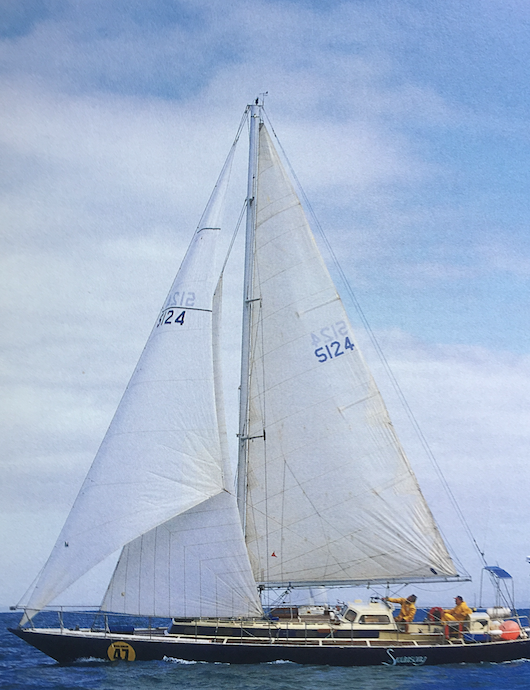 However, it was fortunate that all yachts sailed through the Strait safely into the Tasman Sea led by the large yachts of the Racing Division, Class A, as expected. Out of the fleet “NRN Nakiri Daio”, one of the top favourites, was forced to make a late start which was disappointing. 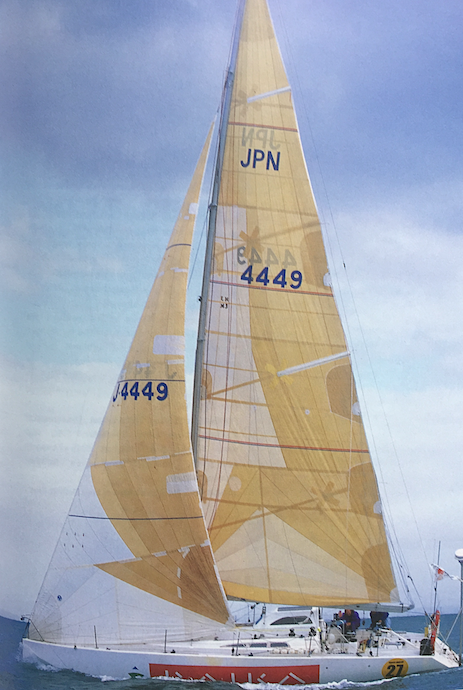 Many Japanese yachts had to endure the pressure of the delivery cruise of 5,500 miles before the start, greatly different from Australian and New Zealand yachts which sail home at their leisure after the finish. The Japanese boats had to sail through the rough waters near Japan between winter and spring in order to reach Melbourne by the deadline. With the the increased possibility of damage to the hull, this puts them in the position of having to face a serious challenge, both mentally and physically – the equivalent of the race itself. To take some examples: “Lucky Lady Gifu” left Japan at the end of the previous year with sufficient time but during the delivery cruise the hull was damaged seriously and the repairs in Sydney took more time than anticipated. The yacht reached Melbourne barely in time for the deadline. “Raika”, whose skipper was a victim of the Kobe Earthquake, left Japan in February, about one month later than scheduled. In order to meet the deadline, the yacht which also suffered damage to the hull was delivered by land from Brisbane to Melbourne, where repairs were completed just before the start. “NRN Nakiri Daio” was heavily damaged and was initially expected to start one-week late. But with great effort, the yacht was able to start only a day and a half late. “Naruto II” was damaged during land delivery and was forced to give up participation altogether. “Brindabella” was not able to start as repairs could not be carried out in time. Looking back on the race overall it was fortunate that there were no serious accidents. On march 30th, “Fontana” entered the Port of Eden and retired due to damage to the hull. 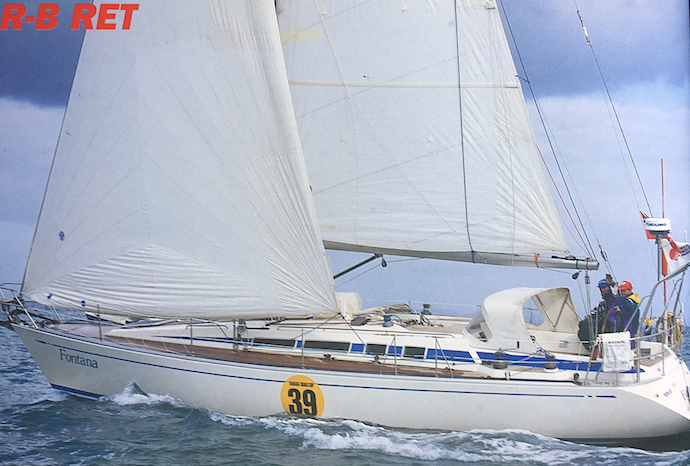 On April 2nd, “BT Global Challenge” informed the Race Committee that the yacht would enter Southport with engine trouble but resumed racing on the 4th instead after having effected her own repairs. On April 7th, “Outrageous III” retired due to damage to the hull and entered Gladstone on 10th. It sees that some yachts other than the above-mentioned had problems to some degree but all of them continued racing after finding makeshift solutions. Without encountering any health problems all 26 competing yachts crossed the finishing line in Osaka safely. The speed achieved by Racing Division, Class A was outstanding. The yachts of Class A occupied the top five positions and the top three made record speed, shortening the elapsed time achieved by the top boat in the previous race. (For”NRN Nakiri Daio in third place, the actual elapsed time used for comparison does not take into consideration the late start.) These top three yachts made an average speed of 7.8-8 knots, allowing for the fact that they sailed through the equatorial doldrums where the winds are unstable. It seems that they must have sailed at around more than 10 knots on many days. The average distance covered by the top five is 5,192 n.m., shortening the previous average distance by 58 n.m., while the average elapsed time for the five is 29.6 days which is very close to the previous top record. In spite of the influence of weather conditions, the above-mentioned record also shows the skill of the crews, the improved performance of the yachts and that the experience gained from the past two races enabled them to choose a good course. 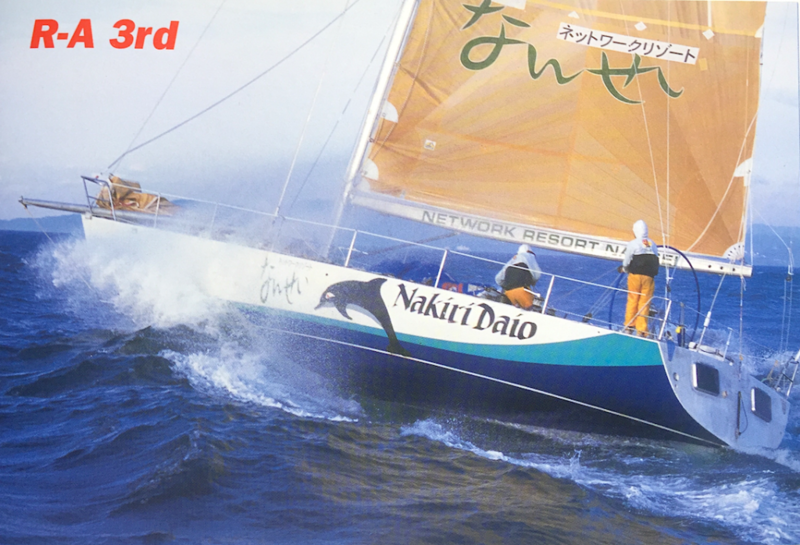 The top five yachts were: “Elliott Marine”, which lead the fleet from the start all the way to the waters near Osaka Bay. 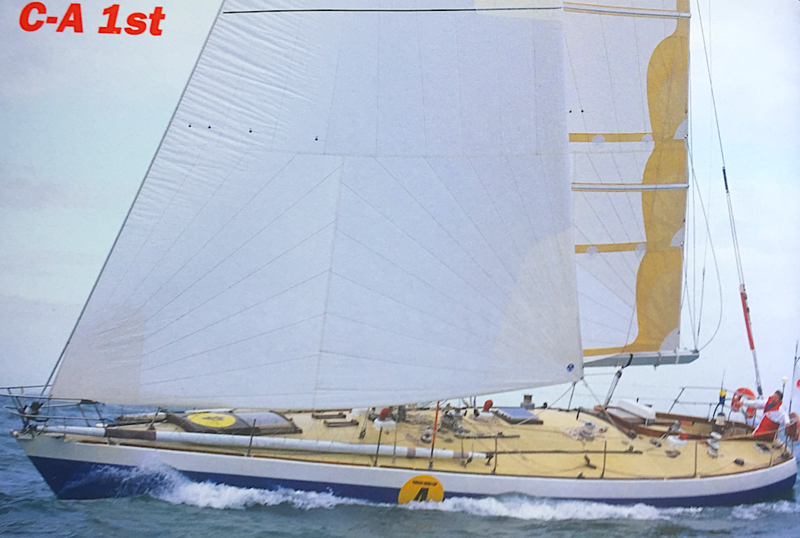 “Wild Thing”, which followed “Elliott Marine” continuously with a difference of 10-80 m.m. and sometimes during the race closed up with a narrow margin of 2-3 n.m. then finally in Osaka Bay, caught up and outsailed her to win the race. “NRN Nakiri Daio”, which made a day and a half late start, putting herself at one time more than 300 n.m. behind the top group, speeding up dramatically to jump into third place on April 11th. 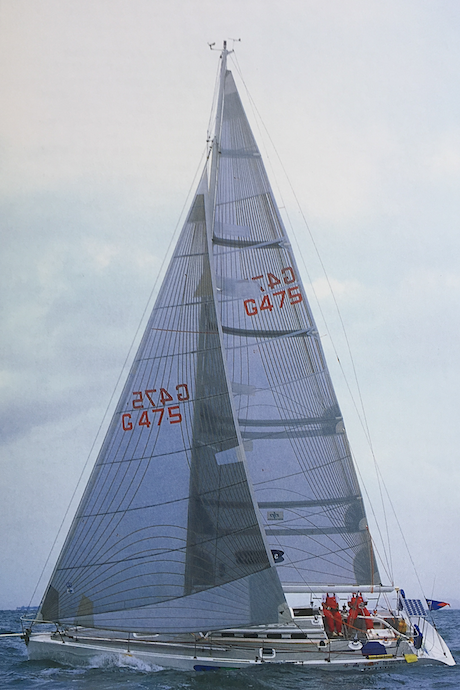 “Bengal II” in fourth place and “Beyond the Fringe” in fifth place were always in the top group during the race. Compared to Class A in the Racing Division, Class B and Class C did not leave any outstanding records this time. The Class B top vessel “Fast forward” and the Class C top vessel “Priscilla” finished about 10 days later than the Class A top vessel. The average elapsed time for all classes in the Racing Division was longer than the previous record. 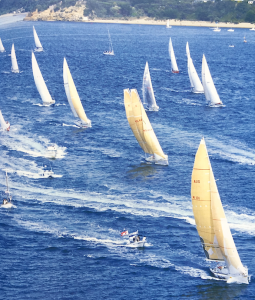 For example, the average distance covered by all yachts of Class B and Class C was roughly 5,350 n.m., which was not so different from the average distance covered by the top five yachts of the Cruising Division. In the case of long-distance ocean race, yachts that cover a shorter distance do not always finish earlier. However, as mentioned earlier, one of the factors resulting in the shortened elapsed time was to select a good course. In this race classes were also established for the Cruising Division, but unfortunately there were only 6 entries in this Division. Although the average speed and elapsed time for “Yoko” in first place does not vary from the last time, the average elapsed time overall is 12% less than the last race. Some suggest that yachts of the Cruising Division should start a few days earlier so that they can reach Osaka at almost the same time as the Racing Division. As far as the race results this time, it does not seem that there is any need for such measures. We cannot help but hope more yachtsmen take up the challenge in future races.